Commercial rafting on the Arkansas River brought an economic impact of more than $55 million from 179,535 user days in 2013, according to an end-of-year report by Colorado River Outfitters Association. Direct expenditures are the total cash outlay for rafting, food, lodging, etc., spent in the local area by one river rafting customer in one day. The economic multiplier is the number of times a dollar is spent in the local area before being spent outside that area – 2.56 times, according to the Colorado Tourism Board. Overall, the report showed rivers in Colorado had an economic impact of more than $145 million in 2013, an increase of 13.5 percent from 2012’s $127 million. In addition, rafters spent nearly 50,000 more user days on Colorado rivers in 2013, including an increase of 10,000 user days on the Arkansas River alone. 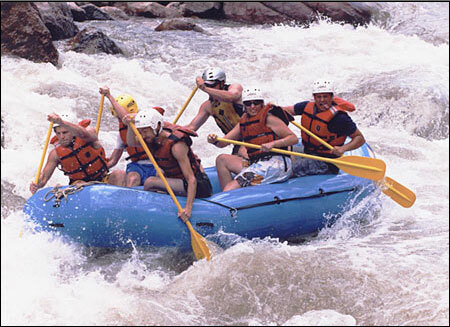 The Arkansas River accounted for 38.89 percent of the market share of river rafting impact in 2013, the largest share by a wide margin. The next closest rivers in terms of market shares were the Colorado River (23 percent combined) and Clear Creek River (13.2 percent), according to the report. Sen. Michael Bennet (D-Colo.) recently cited the association report as a reason to cosponsor S. 1794, also known as the Browns Canyon National Monument and Wilderness Act of 2013. In a press release, Bennet cited the report’s findings, including the $55 million economic impact, and noted that the Arkansas River is particularly popular for whitewater rafters. The bill, introduced by Sen. Mark Udall (D-Colo.), aims to protect the Browns Canyon region as “an invaluable economic and natural resource for Chaffee County and the state” and would preserve 22,000 acres along the Arkansas River as a national monument. “The rugged and unique beauty of Browns Canyon attracts outdoor enthusiasts from around the world who come to hike, camp, climb and raft,” Bennet said in a press release. “This generates millions of dollars of revenue for our local economies. Keith Baker, Buena Vista, executive director of Friends of Browns Canyon and a retired Navy commander, said he was pleased to hear Bennet’s decision to cosponsor the bill. “We’re pleased and honored to have Sen. Bennet on board with this important legislation, which not only protects one of Colorado’s world-class recreational destinations, but was built from the ground up by local people who do business, recreate and make their homes in this part of the state,” Baker said.